I have discussed so many times why I can’t stand Cult Wines from Australia like Mollydooker because they are so over the top laden with alcohol that they are not enjoyable to drink. 16.5% Alcohol is maybe acceptable for an Amarone but not for a Syrah or Cabernet Sauvignon or Merlot. As a Certified Sommelier, I can never give up on wines from anywhere in the world and am constantly tasting. It’s been about 10 years for me but I finally stumbled upon one from Australia that is elegant, rich, silky and well made and most importantly as usual AFFORDABLE. It was once customary for a small group of zealous Barossa pioneers to regularly seek the cellar retreat of an old vineyard cottage. Within the cool stone depths of this hidden refuge,they used to waste away hours playing cards and drinking wine. Now a lingering part of Barossa history, the crumbling remains of this cottage still stand amidst old vines that constantly produce this excellent Shiraz that always, “comes up trumps.” 100% Shiraz. 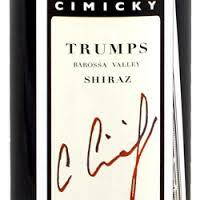 I just stumbled upon this 94 point rated wine by James Halliday who specializes in reviewing Aussie Wines. The first thing I noticed when I looked at the bottle was it was 14% Alcohol. From BAROSSA???? They usually all are hot, hot, hot wines with way too much alcohol. Beautiful dark purple color in the glass with aromas of fresh berries and plums. On the palate this was silky and rich and explosion of blackberry fruits with notes of dark chocolate the tannins were soft and refined. Retail on the bottle is about $20 if you can find it and in a Restaurant at under $50. Yes under $50 in a Restaurant for an AMAZING handcrafted wine!!! So in the Card Game of WINE. The Dealer Might Hand Me A Mollydooker Carnival Of Love …I FOLD!!! Two Hands Bad Impersonator Or Samantha’s Garden, I FOLD….2009 Charles Cimicky Barossa Valley Syrah/Shrias… I am All In Cause Every Once In a While With An Australian Wine You Can COME UP TRUMPS!! PreviousDon’t Run Away From The SOMMELIER!! Next2012 OREGON PINOT….THE NEAR PERFECT VINTAGE !